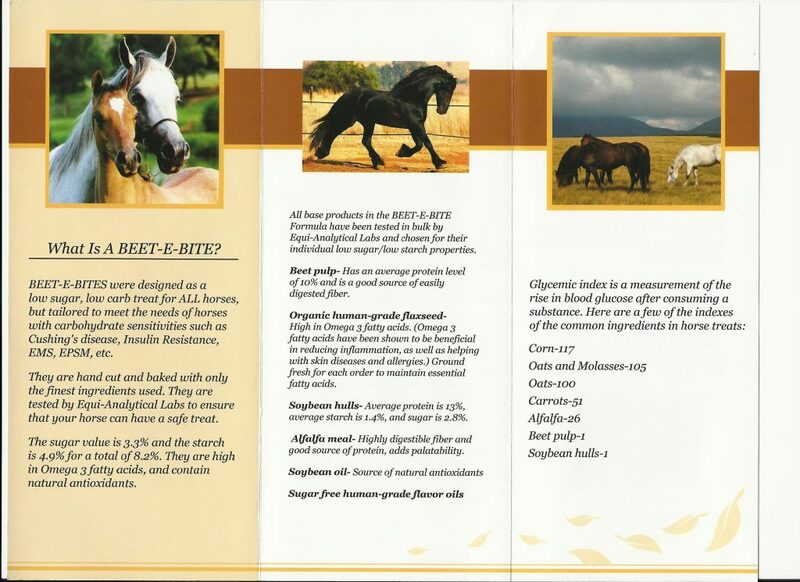 Low sugar, low carb Beet-E-Bites horse treats were developed with the needs of Cushing’s, insulin resistant, EPSM, and other carbohydrate sensitive horses in mind. All horses love to be treated, and now even horses that are sensitive to carbohydrates can enjoy a safe low sugar, low starch treat. 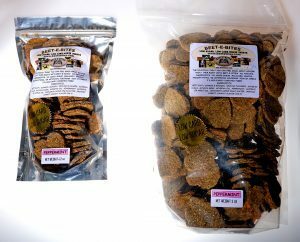 These horse treats are made from the finest ingredients and contain no added sugar, molasses, oats, corn, artificial colors or preservatives. They contain no herbs and will never produce a positive drug test for any discipline or any type of competition. They are tested by Equi-Analytical Labs and are 3.3% ESC (Simple sugars) and 4.9% Starch for a total value @ 8.2%. Recommendations for carbohydrate sensitive horses are 10% and under. Treats come in four great flavors: Peppermint, Apple, Carrot and Licorice! As they are all hand cut, they may have very slight variations in size. 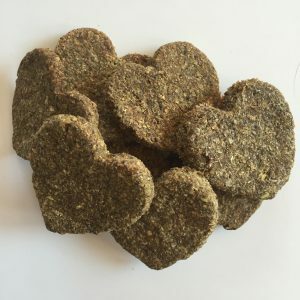 BEET-E-BITES treats are formulated with all natural, low sugar, low starch ingredients, designed for horses with Insulin Resistance, Cushing’s disease, EMS, and PSSM, or for owners who prefer not to feed excess sugars and starches. They are fresh baked to order, and include stabilized flax seed for the Omega 3 fatty acids that horses require. Beet Pulp – referred to as a “super fiber” due to its high digestibility and ease of fermentation. Average protein content is 10%. Only NON-GMO beet pulp is used. Stabilized Flaxseed – rich in Omega 3 fatty acids, beneficial for a variety of inflammatory conditions, skin problems and allergies. The flaxseed is stabilized so the Omega 3 fatty acids are not damaged in processing. Omega-3 fatty acids are essential fatty acids, meaning the body does not produce them. Therefore they must be consumed in the diet. Cold-Pressed Soybean oil – contains natural anti-oxidants including vitamin E. A small amount of oil is used, just to mix our flavorings with, and provide better dough. Feed 1-3 daily per 500lb body weight.